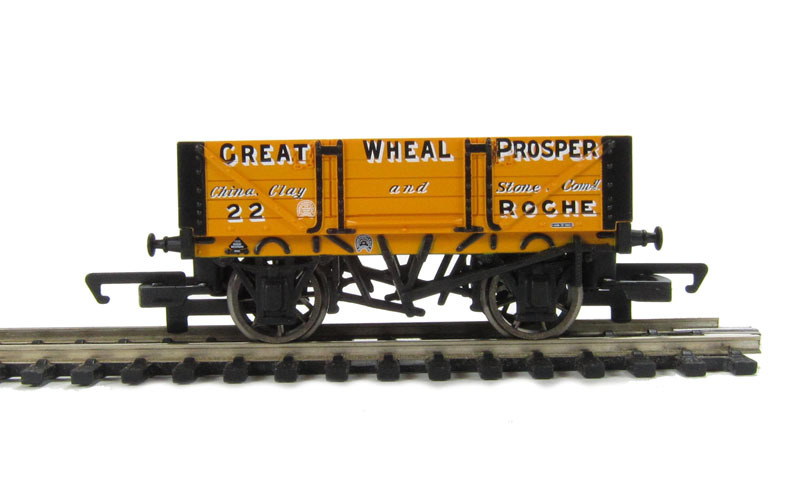 I managed to get down to a train fair this weekend and pick up another Great Wheal Prosper wagon for £8. I actually got to the fair later than usual, some sellers we're slowly packing up and the gent that usually takes the fee on the door (£2) was not there so I thought I'd go in anyway and catch him on the way out. He wasn't there when I came out either so I got in (snuck in) free. The main station building is still under way albeit slowly. I have painted, cut out the window gaps and glued on the L-Cut GWR valancing onto the balsa canopy. Before painting the underside of the canopy, I added the LED's, using a pin to push a hole through the balsa for the LED's legs so as not to damage the balsa wood. After adding the LED's I then pulled the LED's HALFWAY OUT leaving thier legs in thier holes while I painted round them. This was to keep the holes open and not get filled up with paint, which may possibly damage the paint work after it has dried trying to get the LED's back in. Plus, I usually paint white behind LED's in ceilings to hopefully bounce the light back somewhat, so needed them out of the way-ish anyway. Once the paint was dry I pushed the LED's IN more so the paint would not get pulled off if I had pulled them out instead. I will add a drop of superglue to the back of each LED to hold them in place. I wracked my brains trying to think of how to channel out grooves in the balsa canopy to run the lighting wires (The balsa canopy is quite thick for this very reason) so the top of the canopy would sit flat to glue the corrugated roofing on (once made), and my uncle came up with the soloution. I've tried the idea out on a spare piece of balsa and it seems to work without splitting or going right through the balsa so I think this is the way to proceed. Both my experiments, of gluing toothpicks side by side onto 2 bits of wood to make a press for corrugated sheeting for the canopy roof, and trying to laminate frosted pieces of soft plastic for the canopy glazing didn't work. My next experiment for the glazing is to try to laminate small pieces of greaseproof paper. I have bought both the Wills SSMP216 (Corrugated Iron) and the SSMP219 (Corrugated Asbestos) sheets packs to possibly make the canopy roof with some formed foil using the sheets as a mould of sorts. This, as mentioned recently on the forum, should really be the thicker Turkey Foil rather than run of the mill aluminium foil which I am yet to buy. My idea is, once I have formed the foil, to spray it with something to try and hold it's form. This could be spray paint or spray glue and more than one layer if needs be. I don't think this can be done with a brush as it would distort the modulations in the formed foil. I checked out the price of spray adhesive in a couple of shops on Sunday. RIDICULAS prices , so I may be able to get some for free or I will buy it on the net at a fraction of the price. The formed foil will be glued to a card backing after this as well (another reason for the spray glue), as it will extened beyond the actual balsa canopy, with cut outs in both the foil and the card for the canopy windows. So a few more things to get hold of or buy before I can actually finish the station building but I can work on the electronics for the lighting in the meantime. A quick update of where I am on the station building. Here is the pieces of greaseproof paper for the rooflights laminated, and the ones I have cut out to use lying on the cutting mat. A close up of the L-Cut valancing glued in place. Here is a view of the top side of the balsa canopy with the channels cut out to take the wiring for the lighting. I ended up making the grooves with a combination of different shaped files, scapel and small flat bladed screwdriver. The ballpoint pen just made a mess. I used the canopy as a template to make a cardboard backing from a cereal packet for the corrugated roofing to glue to once I've made it, cutting out the rooflight apertures and then spraying the cardboard with grey undercoat. I didn't realise it was such a light grey so I will need to go over it again in a darker grey too but hopefully this will strengthen the cardboard somewhat with multiple layers of paint. I am going to add the rooflights I've made inbetween the balsa and cardboard. This way I can glue some left over laminated plastic pieces here and there to keep the roof flat all over. I am also thinking to add surrounds to the rooflights perhaps made with matches but that will not be until near the end of the build. Next thing to do is start installing the lighting. You have been busy. It looks good so far. Slowly plodding along with my station building, I have stuck the windows in and took a few days to think how I could connect and solder the wires together for the lighting. I ended up doing it by first soldering on the resistors onto the all the positive legs and then went along soldering wires to the LED's negative legs, daisychaining them alltogether with small pieces of wire by wrapping them around each negative leg and and soldering the mess together, starting with the furthest LED from the where the wires come off the canopy. I glued the wires into the channel with the Gorrilla Glue brush type applicator as I went, making sure nothing poked up above the top of the balsa and waited for the glue to dry each time before moving onto the connections for the next LED. This helped keep everything exactly where I wanted it. Here's all the wires glued into place. A close up of the connections. I have ordered the thicker turkey foil I need to make the corrugated roof for the canopy which will be with me sometime this week. I have made the card former which will be glued underneath the corrugated roof (on top of the canopy) and sprayed it multiple times with paint to try to give it some stiffness. I am also thinking to give it a couple of coats of hairspray both sides just to try to strengthen it some more then spray paint over it again. With the windows cutout on the cardboard hopefully this will help when cutting out the window apertures of the foil. Next thing to do is paint the canopies wiring and wiring channel black. I will master this station...station master! I have most of the items I need to finish the canopy but I am still waiting on the 3M 77 spray glue. I went to buy it off the bay knowing it was £13.99, but just before I bought it I thought I'd just do a quick search rather than jumping to buy the one in my watch list and lo and behold I found a seller who had 1 can left (of 4) at only £7.50 INCLUDING postage! No projects have moved on of late as life does have a habit of getting in the way but once the 3M 77 arrives I will settle back down to some modelling. A quick question if anyone can answer. Can you paint over varnish? The reason I ask is that I want to stiffen cardboard. I've spray painted it a few times and even given it a couple of layers of hairspray after that but it's not quite as sturdy as I'd like. You will be able to paint over it just fine. Give it a light sand with a fine grade paper first to key it though. You will find it may want to soften as you paint it if your putting a lot of product on in one application or one with a high solvent content. If that happens just do light coats. Thanks for the reply joshv8. That's good news. I'm actully looking to use a spray varnish rather than paint it on to get thin layers but wasn't sure if the over painting would stick to the varnish. I visited Worthing Toy and train fair today and lo and behold they had an Intercity buffet coach with the silver window surrounds for only £8. Over the last few months these have been averaging at around £30 on the bay. I snapped it up to go with the rest of my 125 train. My 125 formation is now complete for the size of my layout. Engine and dummy cars, 2 lit coaches, sleeper and buffet coaches. Well after a few tries I just couldn't get the foil for my canopy right so I have decided to use the Wills sheets themselves rather than as a former/mould for the foil. I've already cut the 2 sheets I need to size and sprayed them with black as an undercoat. I now need to lay them upside down, side by side to mark out the apertures which need to be drilled and filed out. I cant add any pictures at the moment as I've left the camera in the car. End2end wrote: Well after a few tries I just couldn't get the foil for my canopy right so I have decided to use the Wills sheets themselves rather than as a former/mould for the foil. When you can manage a camera I look foward to seeing some progress! joshv8 wrote: When you can manage a camera I look foward to seeing some progress! Not much to show just yet. I tried using my mini drill to drill holes around the edge of a couple of the apertures then filing away to the marked line. This was a long process so I decided to have a go using a cutting disk that came with the drill. Somthing that I hadn't tried before. This made the job very easy then using the file, I straightened up the corners. Here you can see the 2 pieces of corrugated sheet with most of the apertures now cut out, the mini drill with cutting disk, the small file and the cardboard former/template. Spraying them black before cutting out the apertures really helped when marking out the underside. Now I have sprayed them with grey undercoat on top of which will be the final coats of paint. This is where I am upto so far tonight. And then a coat of stippled on white for more seagull..... scent. Far too much white at the moment (it looks like remnents of the last snowfall ) so still needs some stippled on grey shades and a little green here and there. And some more darker greys stippled on to tone it all down to finish. Next task is to glue the canopy roof onto the canopy proper then glue the whole finished canopy to the station building.